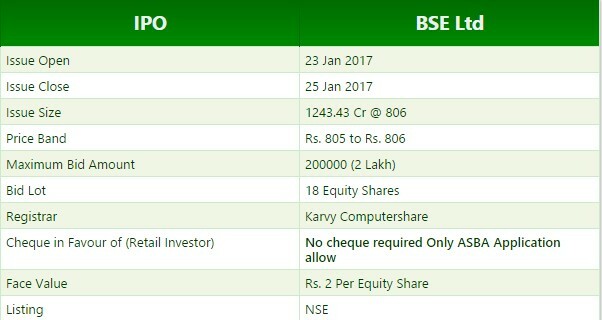 BSE Ltd is coming up with a further Public Offer (IPO) of its shares between 23 Jan. 2017 to 25 Jan. 2017. The price band of Issue is Rs. 805 to Rs. 806. 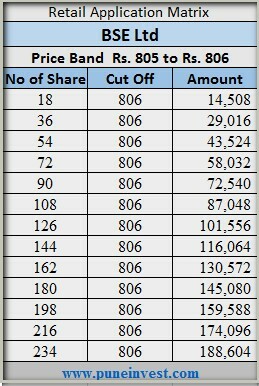 The minimum application size and bid lot 18 Equity Shares and in multiples of 18 Equity Shares thereof. Bombay Stock Exchange (BSE), the first stock exchange in Asia, which was formed on July 9, 1875. As of 30 June, 2016, the BSE was the world’s largest exchange by number of listed Companies, and India’s largest and the world’s 11th largest exchange by market capitalization, with US$ 1.52 trillion in total market capitalization of listed companies.